Hello, My name is Myung-jin Choi, the programmer using MongoDB. 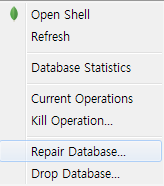 I think a confirm dialog box is really necessary for 'Repair Database' menu to avoid this kind of problem. Would you add this feature in the next version? Hi @gloomyrose , thanks a lot for your suggestion. We have included this fix into next release version 1.3. You check the beta. Feel free to open the ticket if you find problem again.